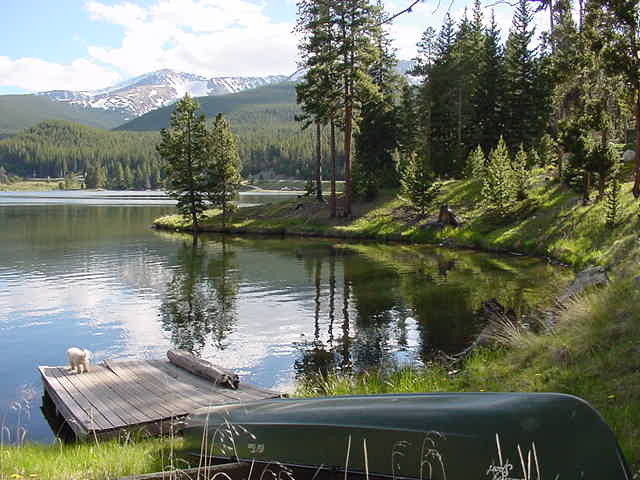 Timber Creek Estates is a neighborhood south of the town of Breckenridge and butted up against the the national forest and Red Mountain. These large homesites are part of the small town of Blue River, and that means homeowners of Timber Creek Estates have the liberty to use the town's Goose Pasture Tarn, pictured below. Timber Creek Estates are naturally private and have easy access to ski and hiking trails. From your living room in Timber Creek Estates you can see the highest mountain in Summit County - Quandary Peak. The trailhead is across Highway 9, and so are trails up McCullough Gulch which runs into the popular Wheeler Trail, and the Spruce Creek trails such as the one to Mohawk Lake. Spruce Creek Road also offers acces to the winter-access back-country cabins in the Tenmile Summit Huts system, Francie's Cabin. And from it, many more lakes and peaks as well. Red Mountain is out the back door and can be climbed with a little bushwhacking. Drive south on Highway 9 to Blue River. At the town hall take a left onto Whispering Pines, and all of the homes south are part of Timber Creek Estates.